How Do You Define Financial Freedom? Can freedom be bought? Are there any (financially) poor people who are free? Are there any (financially) wealthy people who aren't free? If someone were to ask you, “What's your definition of financial freedom?”, what would you say? Be honest with yourself: Would you reply with a concrete definition? Or would your answer be more abstract? Are you on track to reaching your retirement goals? Are you a slave to your debt? What will happen to your money after you die? Are you on course to achieve financial freedom? If not, would you like to know for sure? The idea of financial freedom is no conspiracy to deceive the masses, but it sure has sold vast quantities of financial products and services! How many books, websites, blogs, magazine articles, media advertisements, and financial planners have used the term financial freedom as leverage to sell something? But how can a person be free if their idea of freedom is defined by monetary means, by someone else — or not defined at all? It's important to be aware of abstraction, ideology, and dogma when you encounter it. If the term financial freedom isn't made concrete (defined by and for a specific person), there's a danger that true freedom may never be obtained regardless of financial wealth. Would you agree that life isn't about the destination, but about the journey? Financial goals are destinations; they're not life. But isn't the freedom that money apparently purchases worth the sacrifices we make to reach this freedom? Try answering this question by asking another question: Can freedom be bought? If not, then what does this say about the pursuit of financial freedom? Meaning precedes money; purpose precedes planning. It's contradictory to believe that a given life objective can be reached by financial means. The blind pursuit of financial freedom is often closer to slavery than it is to liberation. It's making life a tool for money, whereas money should be made a tool for life. I believe that financial freedom, if it exists, lies at the point at which the utility of money begins to diminish, the point at which the basic sources of physical well-being — food, shelter and clothing — have been met. At this point, financial freedom may be had by (and defined as) the capacity to eliminate the desire for more money. Or, expressed in one word, contentment. Really, though, the only wrong definition of financial freedom is the one that isn't yours. Don't allow any financial planner, family member, friend, blogger, or anyone else to influence your definition of financial freedom! With that in mind, what is your definition of financial freedom? Does it even exist? Can freedom even be bought? Are you free yet? Kent Thune is an independent, “fee-only” investment adviser and free-lance writer. He is also the Mutual Funds Guide for About.com and he blogs about the meaning of life and the purpose of money at The Financial Philosopher. There are 70 reader responses to "How Do You Define Financial Freedom?". My definition is being debt free. Once I have paid off my debt, I will be free to spend my money however I want and will no longer be a slave to my debt. It will also give me the freedom to take a lower paying job if I want, allow my wife to stay home with our kids (once we have them) and be less stressed. With that in mind, I am definitely not free yet. I still have a long way to go, but am making good progress. My definition is similar to the one stated in the article and is adapted from Van Tharp, the trading psychologist and coach. Basically, if one can generate enough passive income through investments to cover all living expenses, then he or she is financially free. This does not mean one immediately retires, but that is certainly an option. Otherwise, a financially free person can take a lower paying job, go back to school, travel, or do whatever he or she wants. For me, it’s having enough (mostly) passive income to be able to do what I want with my time. At the moment, that income comes from a business. Later, it’ll be more heavily funded by investments. For me, financial freedom is a moving target. When I was just starting out, freedom meant earning a salary that equaled my age. If I was 25 I wanted to earn $25,000 (I worked in social services, yes I had a college degree and yes this was a few years ago). My husband and I, right after we were married worked on what we called a “freedom project” to rid ourselves of all our unsecured debt ($55,000+). I find being debt free (except for the mortgage) to be very freeing. I really like not have to pay any credit card bills or debt service. So now that we are debt free we are working, slowly, on paying off our mortgage. I go back and forth on whether we ought to put more money towards our mortgage or not. We are also maxing out our tax advantaged savings (401ks and IRAs) and putting more money away into our emergency fund. I find that having $40,000 in cash/CD savings to provide a large measure of comfort ($25,000 of that is emergency fund, the rest is earmarked for other short and medium term goals, i.e. escrow payments, etc.). I would say that the next step in freedom for us is (1) increasing savings/investments and (2) paying off the mortgage. I hate starting my comment off with “Great Post” because it is the most overused 2 words in the comments section of blogs. When I was a corporate employee who hated what I did, I honestly thought the answer to all my problems was to make enough money so that I could retire and never work again…. THEN I could be free and enjoy life. What a sham!!! I wasted 10s of 1000s of dollars in scams,programs,etc… that supposedly help you “make” a lot of money. Why? Because I wanted to be free. Then I asked myself, what do I REALLY want? What I really wanted was to have total control over my time and to feel powerful. To feel as though I could make a difference. The real solution was to take the leap and start my own business doing what I want on my own schedule. By doing so, I created the ultimate freedom for myself. It doesn’t mean it is easier. There have been times where money was tight and that is the nature of being in business for yourself. The upside is that the earning potential is way higher and the freedom to spend each hour as I choose is amazing. Thanks for writing this. I’m fired up now! So pleased to read this! Honestly, I was baffled to learn from last week’s comments that there are people out there who live purely for the future. That is, without a doubt, being a slave to money. As for your question? I haven’t actually figured it out yet. I guess I’m on the abstract side – I just want to be able to say “sure, why not?” to anything life throws at me. Ours is to be totally debt free and able to live off our investments without a job. We aren’t there yet but working to get there. I definitely think financial freedom means different things to different people. The fact that we are debt free outside of our mortgage may mean we are debt free to some because they don’t view a mortgage as debt, but more a necessity of life. Our house will be paid off within 7 years. However, I think I will free financial freedom once all 3 of my kids are done with college, because then (hopefully), all major money sucking expenses should be done. Our expenses will be minimal, and income should be quite good. We should then have the freedom to spend however we please, without feeling guilt or worry. Money won’t be a focus. At 28 I only recently (in the last year or so) came out from under credit card debt. Up to that point I was a complete prisoner and tied to the whims of other people 100%. There was no freedom there at all. I couldn’t even think about true financial freedom while under that burden. It was like asking a drowning man to try and envision himself soaring above the clouds. He’s too busy trying to not drown to do anything else! The desired result from all of these steps is so I can be free to take on new opportunities whenever they present themselves. I don’t ever want to be in a position where I can’t afford to lose my job, or I feel trapped somewhere because I can’t afford to make a change in my life. My wife and I also love to travel, so I also want the freedom to take a fun trip every few years and not panic about the cost. I want the freedom to work because I want to, do things and go places I enjoy with friends family. Although like most people, I too use the mathematical definition: “replace working income with investment income” that they outlined in YMOYL years ago, I agree that there’s also a huge freedom to be found in YMOYL’s concept of “enough”. How I got to the dollars and cents freedom was by learning the freedom that comes with self-control. Having been a somewhat mindless and emotional type of spender before, it was kind of a revelation that I could actually enjoy life without buying stuff or experiences. Now that I’ve spent over 10 years assessing whether I’ve obtained value from my spending in proportion to what it costs in terms of time it’s become second nature and what used to feel like the punishment of depriving myself has become just the (usually temporary) choice that has to be made to achieve longer term goals. I follow the more traditional definitions: Financial freedom is defined by having sufficient monetary resources to produce enough income to support one’s desired lifestyle. The resources can be anything that can produce or be transformed into income. I very much like the definition of “rich” from The Millionaire Next Door, which states that you are rich if you could keep up your current standard of living without working for a period of at least ten years. A slightly watered-down version I strive for is to have enough savings and zero debt (including mortgage) that, even if I still need to work, I would have the freedom to accept a position that pays substantially less. Every one talks about being debt free as financial freedom. Which on the surface makes sense; and what I am striving for. But can you be financially free while in debt? I believe you can. Think about it….if freedom = contentment, can’t you be content while still in debt? I am not talking about living paycheck to paycheck. You are working in a job you love to do, you are putting away for retirement, your personal relationships are growing, you can do reasonable things without endangering yourself financially, and you are paying your debts.In my eyss this is freedom. I agree with Andrew. Daddy told me once the only thing that can’t be taken from you without taking my life is what I know. I am looking for freedom, not just financial freedom. I love Van Tharp’s definition of financial freedon: When your passive income (without cutting into inflation adjusted capital) is more than your outgoings then you are financially free. i.e you never ‘have’ to work again. So if you have $500k capital, 4% is $20k a year. If you can pay all your bills and eat on $20k a year then theoretically you never have to ‘work’ again – you can pursue what you want to do. The number allows you to live forever. Once again, this old saw. OK, it works for many – but NOT for, I suspect, many many more. I, for example, would have to work at my present job until I was about 150 years old, no exaggeration. Therefore, such formulae are worthless to me. I am, however, debt-free, and my house will be paid off this winter. I have some retirement money, some savings, and those will serve me well enough. I never expected a jet-setting retirement. It will be very frugal. But guess what – it’ll work for me. Bosh on all formulae! There are two kinds of freedom being discussed here. LIFESTYLE freedom is having options and being content with life right now, however someone defines that. FINANCIAL freedom is much more defined – being able to pay your bills without working at a job, period. Having a job you enjoy, being debt-free, spending time in fulfilling pursuits, not worrying about money – all these are lifestyle freedom for sure, but not necessarily financial freedom, unless you don’t have to work to make it happen. My goal for financial freedom is having enough tax-favourable passive income (dividends)to pay my house taxes and utilities each year. I’m almost there, thanks to dripping stocks for several years. Knowing that these payments are covered, I can then concentrate on my lifestyle. For the long term, financial freedom will be when my husband and I are able to choose whether to work. What I’d really like at this point in life, is to be able to take a job which allows me to work true part-time hours. Financial freedom is the knowledge that we have plenty and can survive in a manner that is comfortable. We travel,learn and enjoy when we want. We have been financially free for years. With this freedom we have the choice work,or leave work, when we desire. We are not wealthy and, to be honest, I have no desire. For weath brings great responsibility- which could tie up my freedom. My sister has much more, but is striving for a larger “number”. About a month ago she figured out that she was free. I could see the relief in her every day attitude, even though she continues in business (one that she enjoys). For us financial freedom begins with naming every dollar, which we do now. It continues, or grows, with being completely debt free. At that point (in about 4 years), we can use the money we earn to invest for retirement and in our own small business. I think the slave analogy is a good one — you can be a slave to your own ideas about money and what it means in your life. My definition. . .being debt fee. . .thanks to the Dave Ramsey Financial Peace program. . .and being able to accept the option of retiring at the age of 52. . .living fulltime in our awesome RV. . .and traveling America. . .God is good! I have to say my husband and I have been on our journey for about 2 years now (just slightly less). We have considerable student loan debt, so right now financial freedom looks like not having any student loan debt (no car loans, no credit cards, no mortgage because we rent due to moves around the country with a job). But I tend to subscribe to the more investment income coming in then bills going out. once our student loans are paid off, we plan on buying acerage in the midwest that we could pay off, and then start saving to build our retirement home. We don’t have children, live with relatively low overhead once our student loan payments are gone, and we are both graduate school educated and could make very decent salaries in our respective science fields. Right now it feels so far away, but after playing with an excel spreadsheet and conservative savings and investment returns, it looks like we really could be where we want in 15 years, which has us “retiring” as 43 with a healthy passive income, no debt, and the world to travel! LOL. We are avid cruisers and have gone on a 1 week cruise each year since starting our journey as a reward for holding our standards and goals all year (and that weeklong vacation is surprisingly cheap! Our inside cabin for a week is less than $1000, free food, we often opt to get off the boat and tour the cities ourselves, so we have no other real costs while on board other than small gifts like magnets of the places we have been! And we are lucky to live near cruise terminals, so we just drive there and pay $100 to park for the week). Financial freedom is being able to pay my bills and go on possibly 3 or 4 cruises around the world a year! @6 Becca: I agree that living for the future takes away from the present moment, which is where life is. For some, however, the thought of a brighter future makes for a brighter now. Thanks for the comment! @9 Monkeymind: It’s funny you mention Viktor Frankl. The exact quote you shared headlines my post today at The Financial Philosopher! @10 Mikethered: I like your question: “At what point will I be able to stop worrying about money and just enjoy life?” As Viktor Frankl said, “A human being is a deciding being.” You can decide to stop worrying now. @14 Randy: You have defined freedom without attaching “financial” to it. I love that! @16 threeoutside: I agree that the conventional, money-centered, definition of financial freedom is not achievable for many people, which is why I encourage people to define it for themselves. The ultimate definition of Financial Freedom (for me) is not having to *think* about money. Whether it comes in or goes out, there is enough, but the amounts are of no real concern. This could mean a meager income and very little in the way of want, or it could mean a large income with the desire for many luxuries. I think I will feel financial freedom when I pay my mortgage off. I would be able to take a less stressful/less paying job and not have to think about owing anybody. It’s not a destination, it’s a quest. For the poor, basic shelter is the biggest dream that can be dreamed. A multi-millionaire who settles on the aim of paying the bills without having to go to work will be miserable. We all need something to excite us about the idea of getting up tomorrow morning. We all have love to spend. Financial freedom is when you use your money to pursue ever higher goals rather than smaller, more narrow ones. No one can ever achieve full financial freedom in this life. But everyone should always seek to do so. I am very much into environmental sustainability and social justice, as well as some things that make me personally happy (beauty around me, horses, dancing). To me, financial freedom is the opportunity to work in fields/roles that I love, that feel meaningful – no matter how much the salary is – combined with having time and money for the hobbies I enjoy. As well as a cushion for emergencies/real old age savings. But I never cared for early retirement or something like that – I am building my skills and expertise to find work I wouldn’t want to retire from. Finding meaning never was a problem for me – I always had activities, passions, and interests that deeply engaged me. And I have never been very materialistic – I do care for beauty of the things I have, but once I have what I like I feel no need or desire to buy anything else. One of the best pieces about contentment I have read in a while. I will check out your site. 3. $25k in additional savings. 4. Strategy to pay for our son’s college education. We’ll still work, and we’ll still pay into retirement, and we’ll still bring home a paycheck, and we’ll still live as simply and frugally as makes sense for us, but we’ll have enough money that we can literally do anything we want, so long as we don’t want to do everything. If I had $30m in the bank and never had to work, that’d be nice, but I imagine that even then I’d find myself getting a part-time job somewhere. I’m 28, my wife is 27, our son is due in August, and we’re on-track to reach this goal within the next 5-10 years. Not worrying about food, shelter, next week, month or year. I love the word “arbitrary.” It seems like so many definitions are exactly that. Maybe the question is “freedom FROM or IN finances.” Perhaps financial freedom is not having finances in your life. If you could do whatever gives you meaning and joy without the thought of money – perhaps you have enough money for that and have automated so much that you only need to hand over money when you’re buying the next experience. Or perhaps you do think about money, but every thought reminds you that you control where your money goes. Freedom is autonomy, control of yourself and your decisions. Truthfully, I have financial freedom NOW. I can pay all my bills and travel and go out and enjoy life, and also save some for the future. Yes I have a job, but I like my job and it provides more than just money. It’s not a prison for me. My prison is worry about the future. However, I am taking action; fretting about whether it’s “enough” solves nothing. I simply do what I can with what I have. If more or different action is needed in the future, I will take care of it then, instead of worrying fruitlessly now. Setting aside the worry is what makes me free. To me, financial freedom is the ability to say “&*#* you!” to my boss and quit on the spot if things got bad enough. Not that I would ever leave a job in that manner, but knowing that I have options keeps me sane. I define financial freedom as being able to take off work for a year w/o struggling and able to do whatever I please !! In the past I have been in financial prison while making a ‘good’ living, and now find myself more financially ‘free’ while making less money than I’ve earned in almost 20 years. I think financial freedom is mostly about attitude. Freedom means that I have choices, and mostly, choices are about having an awareness of what my choices are. e.g. I bought gas for the car today and when I wrote down the debit in my checkbook and spending notebook (that I carry everywhere) I realized I had not spent any money in almost one week. I also realized that although it is two days til payday, I have over $250 in my checking account. (not including a small amount in savings.) When I was earning three times my current income in the early 1990’s it was rare that I had any money by two days before payday, making those last couple of days before payday very fearful. I could have chosen not to buy gas today and instead walked or taken the bus everywhere I need to travel, in my city it is not an easy way to function but it is doable. So buying gas for the car was a choice. However it was not a choice I wanted to make. However, some “spending less” choices I do make. I choose not to have cable TV. I have “rabbit ears” and get seven channels, which is about six more than I need. I rarely buy clothes, (probably about $200 per year total) and usually they come from Goodwill or TJ Maxx or big sales at Macy’s. I rarely eat out, but I eat very well at home. I NEVER buy coffee out, even though I am a coffee snob. Instead, I buy fair trade organic coffee a pound at a time and make it at home. A pound for $10 lasts over two weeks, compared to $2 per cup in a cafe. My life is rich and full and I use my money is as a tool to make that happen. I also donate ten percent of my gross to my church, which is heavily involved in social justice causes. At times I get wistful about things that I want or places I’d like to travel. At some point I will make a choice to shift some of my money toward those things, but I feel financially free about 90 percent of the time in my current lifestyle. Part of my money goes toward saving and part on paying off old debt but both are at a pace that is workable for both me and my creditors. I don’t let it make me crazy or compromise my quality of life. Every time I make my mortgage payment I am making a choice. Every time I pay my electric bill I am making a choice. The consequences of not making those payments are not consequences that I want to experience. However, it is still MY CHOICE. Financial freedom to me means having choices. I have all the things I need, but I would like to be able to have all the things I want without asking myself if I can afford it. If someone would ask me what financial freedom means to me today, it would be the ability to work part time without money worries. That’s what we’re working toward. By framing the definition this way, some people can be free while in debt while others cannot; therefore freedom is a “feeling” or state of mind that may or may not be a monetary function. Personally, I like to define freedom first, then use money as only one tool to obtain it (and maintain it). I used money (and debt) as tool to finance the founding of my own company 4 years ago. I am still in debt by I am “free” now, by my definition. For me, “freedom” is a property of a society, not of an individual. It is also a continuum, not a binary value. A freer society is one that tolerates individuals who act in a manner farther away from the status quo. So, an extreme example of a non-free society would be the one in Brave New World, and a much freer society would be one which tolerated all the sorts of behaviors that would be allowed in San Francisco, plus all the sorts of behaviors that would be allowed in rural Texas (which is to say, you could walk through the streets naked, smoke marijuana in your home, go outside of town and shoot off guns, drive around in gas-guzzling souped up muscle cars, marry people of the same gender, and do these all on the same day if you liked). As freedom approaches its maximum, it turns into anarchy. How can I apply “financial” as a modifier to this? I really can’t, so I don’t. In fact, I tend to roll my eyes at people who like to talk about “financial freedom” as a goal. Why? Financial freedom, with the traditional definition given at the top of this article *is* the status quo retirement goal. It’s what you pick as a goal when you don’t really have any specific ambitions. If freedom is about being able to deviate from what’s considered normal, “financial freedom” is exactly the opposite, and therefore a bit of an oxymoron. “Financial freedom” is not one of my goals, so I don’t really need a good definition for it. For me, financial freedom is being able to afford what I and my kids need to live. I have this already, so I feel great! Yes I work, but so what? I like my job. I’m working now on funding my kids’ eventual college education so they will have the benefit of an education and choices like I did. Anything else, they’re pretty much on their own because I only prioritize education–ie if they want to get married or buy a house someday they can pay for it themselves. Or maybe I’ll die sooner than planned and then they’ll get some money from my life insurance but I hope they don’t waste it on something like that. Otherwise–these things are not a priority IMO. I’m also working on having enough money for myself in retirement so I can live comfortably and not burden my kids. My plan for this includes savings, investments, and paying off the mortgage. No, I won’t be filthy rich, but that’s never been a goal anyway. I’ll be fine and able to live in my house and enjoy what I usually like to do even if I live until I’m 100. I’m confident of achieving both of these remaining financial goals, so I feel I have financial freedom. Feels great! My dad raised 11 kids on a construction workers income through the 80’s and 90’s. His last child finally left home, he worked for a few more years and finally retired. He was diagnosed with Colon Cancer within the year. I encourage everyone to live today, while you’re planning for the future, because there is no guarantee that you will have your health (or life) tomorrow. I see financial freedom as being able to spend on your true needs and desires (not others definitions) enjoying life today, and not feeling panicky about tomorrow. By virtue of not having a definition of financial freedom, you have demonstrated a free, individual choice; one that is not dictated by a society or conventional definition. I, too, do not choose to have a definition of financial freedom; I have a definition of freedom but I do not, as you say, “add ‘financial’ as a modifier” to it. I believe financial freedom means living the life that you want on a daily basis. If you have your own business and you have a good handle on it and your finances, then I think you can get a taste of what that feels like. Or you absolutely love your job. Otherwise, I think the traditional definition you provided in your post is the only path. a) To be able to work when and where I want. Like some bloggers that get to travel and work all over the world because of the mobile nature of their business. b) To have steady and stable income streams to provide for everything I need. c) To pursue interests/hobbies at my leisure whenever I want. I love to surf, play music, and train brazilian jiu jitsu and I don’t get to participate in any of those activities as much as I want. d) To see friends and family wherever I want. My parents live on the other side of the country and I see them two weeks out of the year. I am an only child and my parents are getting older. I know money doesn’t buy happiness, but if I could have a thru d listed above I would be much happier. I just want to be able to pay all of my bills when they come and not freak out if I have unexpected expenses. I’d like to have some money saved up so that if I have to quit my job, I can, and if someone offers me the opportunity to travel somewhere cool, I will be able to take them up on the offer. That’s about it. I’d like to be able to retire someday, as well. I learned the term “financial freedom” from YMOYL, so I stick with their definition when I use the term. Why do I enjoy and pursue financial freedom? Because it gives me the opportunity to make choices based on my goals and values, instead of compromising too much because I need to make more and more money. To me, financial freedom includes a lot of the normals: no-minimal debt, savings, retirement, etc. Freedom from the fear that you’re overspending and won’t have rent money. Or fear that you’re overspending even when you’re not. Even before investment, financial freedom starts with an accurate and written down budget that a person can feel comfortable LIVING in. Not squishing into, but really LIVING. Being able to live without fear of your own choices is an important part of financial freedom. To me financial freedom is being able to buy things I’d really like to have, but realizing I don’t need them to be happy. I’ve accomplished this by leading as simple a life as possible (don’t care about new cars, fancy purses, etc.) and not craving things that will put me into debt. I think I’ve achieved it since our only debt is the mortgage on our house and that will be gone in 10 years (or hopefully less). Have you made any attempt to begin teaching Jiu Jitsu, Surfing or Music (or all the above)? I imagine if you live in a coastal area with a large enough population, you could make a good living. If you could exchange all of your financial wealth for an income stream doing what you love on a daily basis, would you do it? What if you decided there was an 80% chance of accomplishing this (20% chance of failure), would you do it? Why not start your Jiu Jitsu teaching now and slowly build it until you are ready to make the jump out of the cubicle job? I believe that retirement planning (financial freedom) is not a function of money planning but one of LIFE planning. Perhaps JD will allow me to write more on this subject in the future. I like your reminder, Tyler, about the spectrum of freedom, and its societal nature. 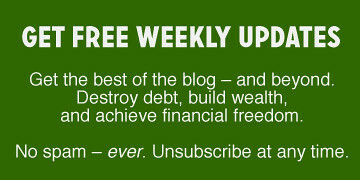 I think that on pf blogs, financial freedom is treated as a milestone, a checkbox, a degree program. You are striving, striving all the time until you cross the line (literally, on those YMOYL charts)to financial freedom. Then you get your badge: Congratulations, you are Financially Free! You can sign your name with the initials FF after it, forever. But real freedom is either societal, as Tyler described, or it’s a personal attitude. It’s not a fixed point, it’s a mindset. If you can’t be satisfied, you’ll never feel free, no matter whether you got for FF badge or not. My literal definition of financial freedom is as follows: $2 million in 10 equities that together contribute a full-time income for me to live off of (through dividend payments – I have already identified these 10 securities, and I am invested in 5 of them at the moment), while also growing the principal balance by at least 5% each year. I would love to reach this goal by age 30 (23 now) … we will see. Further, to me, financial freedom means 0 debt and a home I own outright. On a more abstract basis, financial freedom would mean getting up and going to work everyday because I want to, not because I have to. It is having the ability to continue (or not) in a position as I see fit based on moral and ethical values, without personal finance factoring into the employment decision. I think the term “financial freedom” has gotten a bad rep in the recent past. Whenever I hear it, it reminds me of “get rich quick” schemes that I see advertised. Maybe its just me. Alex (#23) – consider Iowa. You might like Ames, the home of Iowa State University. Ames was just rated one of the top ten places to live. The cost of living here is low, and the people (especially me, ha ha!) are great. I think the term itself (“financial freedom”) is problematic. Because as long as we live in a society, we have responsibilities to that society and our behavior is, in some respects, always at least somewhat bounded by the rules of society. If we don’t generate our own electricity, grow our own food, pump our own water (etc) we have to pay for these goods & services; if we have financial accounts vs a box full of cash we have to deal with banks or brokerages; if we receive public benefits or an earned income we have to deal with the IRS. I think what most of us are actually giving here is our notion of financial *security,* which is a very different thing. Freedom is a state of mind. Security can be quantified. It shocks me a little that people can say they’ve achieved financial freedom when they still have a mortgage! That is neither a free nor necessarily a secure position, as many have discovered. I just want to say, great post Kent. It really made me think, in fact I’ll probably be thinking about it all day today. To me, a large part of freedom is knowing that I am resourceful and well-connected enough to be able to earn an income at whatever stage of my life. So-called “human capital” plays a large part in this. I am not ever planning to retire. If I do that, I may as well die! I’ve given this topic a lot of thought over the course of the rest of the day and I think I’ve come up with a new, more simplified definition of Financial Freedom. Life is full of choices. Some easy, some difficult. Some obvious and some not. When these choices come along, I want to make the choice based on what my wife and I want, and what is best for our lives and our overall goals. I don’t want debt, or a lack of resources to stand in the way of making those choices. By this definition, I have a great deal of freedom right now being debt free and with 6 months in the bank. With a full year saved, my freedom grows and more choices become available to me. Inch by inch, my freedom expands. My choices widen. My options grow more numerous and my fear reduces. I think financial freedom has different phases. 1. Not feeling ill, stupid, or wanting to cry when an unplanned expense hits (like a speeding ticket). 2. Paying off consumer and student loan debt. 3. Having enough disposable income to give freely to those in need without missing it. If someone dies, I don’t bat an eye at sending a $100 bouquet. I’m glad I can “afford” things like this and giving to charity or relatives in need. 5. Fully funded 529’s for kid’s college. 6. Having enough savings to be able to live off the interest. Actually I like the destination more than the journey. That’s not to say that I’m miserable or anything while I work towards something, but at the same time I just like it more when I get to my goal. Now that my debt is paid off, I can think of other things that I want to do with my life like have savings, go to college full-time and finish my degree. I’m 27 so its time to finish. Take vacations…I haven’t gone on vacation in 5 years because of my previous debt, and save for retirement. To me, financial freedom is all about balance; keeping debt at bay and saving for the future while enjoying life in the here and now. One autumn we were visiting NYC, seeing sights and going to see a play. My son asked, “Dad, if you always worry about money, so why are we here now and why are we going to Europe this summer?” I explained it was all about balance. You don’t want to screw over living and experiencing some today hoping you’ll make it up tomorrow, but you don’t want to blow off tomorrow by not planning and preparing for getting there. The balance comes in making choices on what to do today and what to plan for tomorrow and recognizing that choices today affect your tomorrow. He just wanted to make sure we had enough money left over for Christmas presents. What a fantastic comment. I’d love to live there. I think the most important point is like you said: to know what your definition of financial freedom is. For me, financial freedom is more about achieving lifestyle freedom. I am not interested in stopping working, but in ending a dependence on a corporate income. My wife and I are working towards building an income from self-employment that will allow us to make money while travelling and living in different places of the world. That will be our freedom! Bravo for this article! Money should be a tool for life, not life a tool to earn money. It’s a perspective I haven’t heard in a long while. Yes, financial freedom carries different meanings not only for different people but for each of us depending upon our stage in life. I like to share my concept of financial freedom in my workshops as follows: If you’re making your money work for you, then you’re at least on the road to financial freedom. Otherwise, if you’re still working for your money, it controls you and you are definitely not free. Where that road leads is up to the individual, but I certainly hope it’s headed for fulfillment outside of the financial sphere. I used knowledge twice:). It’s important, especially when it comes to your money.